Here at Meeple Mountain we know that gaming tastes are decidedly…subjective. We decided to combine that with just about the only thing that is more subjective–music. Join us as we take a light-hearted, tongue-in-cheek look at the intersection of music and meeple. Carcassone — U2: Huge hit initially; has steadily put out new content. Even though some of it doesn’t always fit, they still keep making more. 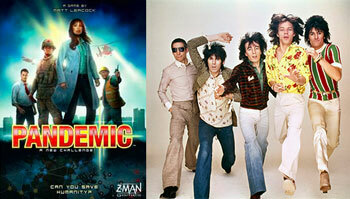 Pandemic — The Rolling Stones: Massive commercial success. Though it’s had a few different styles over the years, they’ve pretty much kept the same lineup. Dominion — The Eagles: Great commercial success. They keep touring and playing music even though not much has changed. Everyone pretty much agrees that the quality of the content is….fine. Happy Salmon — The Ramones: Lots of yelling, objectively not much there, but loads of fun. Twilight Struggle — Rush: Most people acknowledge that mechanically it’s good, but people who like it REALLY like it. Catan — Creed: Sure, you bash it now, but there was a time when everyone was loving it. 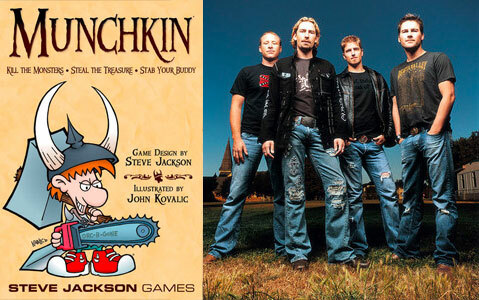 Munchkin — Nickelback: Everyone says they hate it, but somehow it’s still a best seller. All their material sounds the same. Ticket to Ride — The Beatles: Top seller; literally named after a Beatles song. (in English anyway) Kind of a no-brainer there. Kingdomino — The White Stripes: Just a few components, but the end result is phenomenal. Gloomhaven — Arcade Fire: Indie, quite a spectacle, and way bigger than it needs to be. Splotter Games — Radiohead: Not a lot of commercial hits, extremely cerebral. They don’t put out new material often but when they do, fans come running. Dungeons & Dragons: Marilyn Manson. Both are REALLY concerning to your parents. Pandemic Legacy — Led Zeppelin: Now iconic, they “borrowed” elements from other works, used that to create amazing new content. Incredibly popular. Many people list them as their favorite, while others swear that they’re overrated. 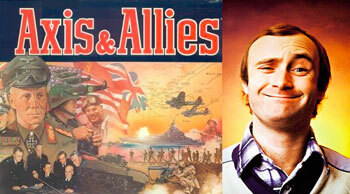 Axis and Allies — Phil Collins: Your dad is still trying to convince you that both are relevant. What do you think? Agree or disagree with our picks? What are some of yours? Tell us in the comments below, or better yet, share your picks on social media with the hashtag #IfBoardGamesWereRockBands. Twitter gave you 280 characters for this very reason! I have loved board games since childhood. Re-discovered modern gaming in 2013 and never looked back. I enjoy stupid, silly fun as much as I do strategy, and aspire to never lose the childlike joy that board gaming provides. Ha! Munchkin’s comparison was spot on. Good stuff. And yes…it would have been dubious to say anything other than The Beatles for Ticket to Ride. Indie phenomenon picked up by a major label and became a global powerhouse before everyone seemed to get sick of it at exactly the same time. More fun when the word combinations make no sense. I would say Catan is a gateway game to other games certainly not Creed. Yes, most will say they don’t Catan anymore, but I look it as introdicing them to other games. So if I had to compare them to bands. I would day 2 country bands, Lady Antebellum or Florida Georgia Line. The Gloomhaven comparison is the truest on this list. Coming from a fan of Arcade Fire I now want this game even more. 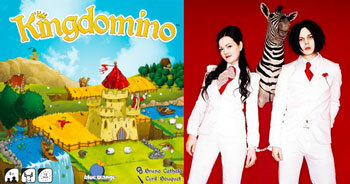 Ah, but which games would win Eurovision? And specifically, to keep things to rock bands, which game is Lordi? This is one of my favorite articles i’ve read all year. Munchkin made me laugh, the rest are spot on.